Steins;Gate 0 was first confirmed for a western release back in May, and now we finally have release dates to look forward to. According to publisher PQube's announcement at London's MCM Comic Con, the digital and physical versions—as well as the Rice Digital-exclusive Amadeus Edition—hit PlayStation 4 and PS Vita in Europe on November 25, followed by North America on November 29. 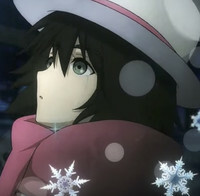 STEINS;GATE 0 is a brand new story in the acclaimed Science Fiction Visual Novel franchise. Praised by fans and critics alike for its incredible characterisation and storytelling, STEINS;GATE is widely considered to be the greatest Visual Novel ever made. STEINS;GATE 0 looks set to maintain this exceptionally high standard with a story which explores an alternative world line. When a scientist Okabe Rintaro realises he is unable to save the love of his life, he sinks into a great depression. Giving up on his friends, his research and, crucially, time-travel itself, a series of events which looks set to endanger all of humanity takes place.